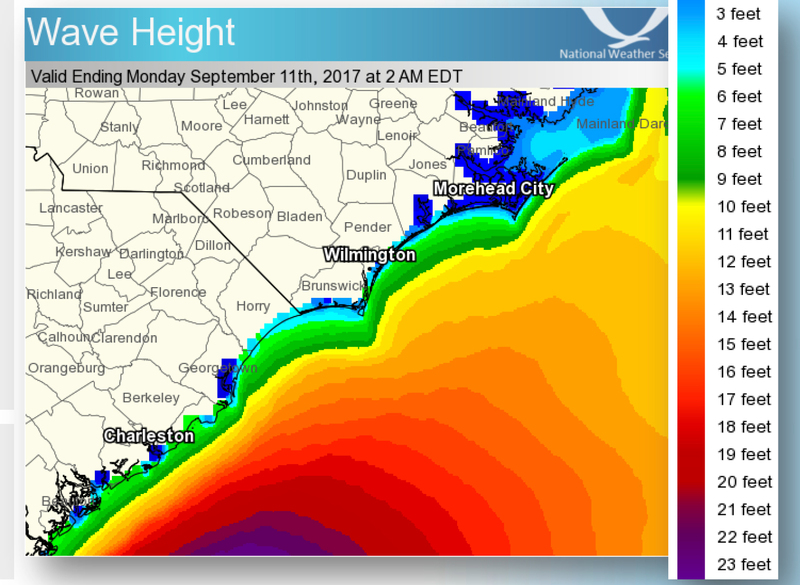 Wave height projections for coastal Carolina from National Weather Service. Weather forecasters on Friday morning lowered the risk of local impacts from Hurricane Irma, as the storm is most likely to affect Wrightsville Beach and other coastal Carolina areas in the form of heightened wave activity and storm surge, with a projected peak of noon on Monday. “There are some big waves out there headed towards our coast,” said National Weather Service Wilmington meteorologist Steve Pfaff on Friday morning. Now a Category 4 storm, Hurricane Irma is forecast to make landfall around the Florida Keys and travel up the length of the Sunshine State. Pfaff said there is little record of a hurricane ever traveling “up the spine” of the state, however, the result would be to weaken the storm as it moves north, creating fewer storm conditions for the area and lowering rainfall projections to 1 – 3 inches. The storm surge could reach up to about three feet, Pfaff said, below levels to trigger a storm surge warning, though a coastal flood advisory could be needed. In addition to storm surge, the area could see increased winds later into the weekend, with winds at their highest on Monday. Pfaff said that the first effects of the coastal storm surge would come with the late morning Sunday tide.